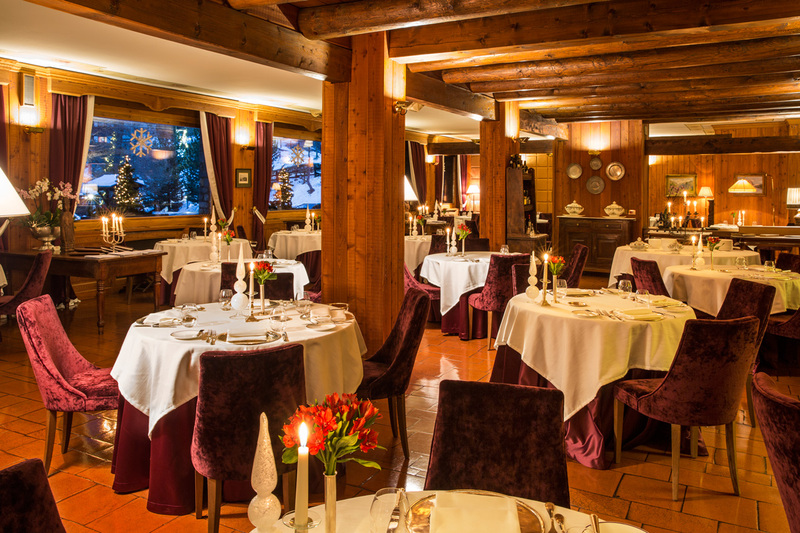 Corrado Neyroz, part of a familiar tradition in hospitality, started in the 70’s. Corrado is the director of Hotel Hermitage Restaurant & Beauty. 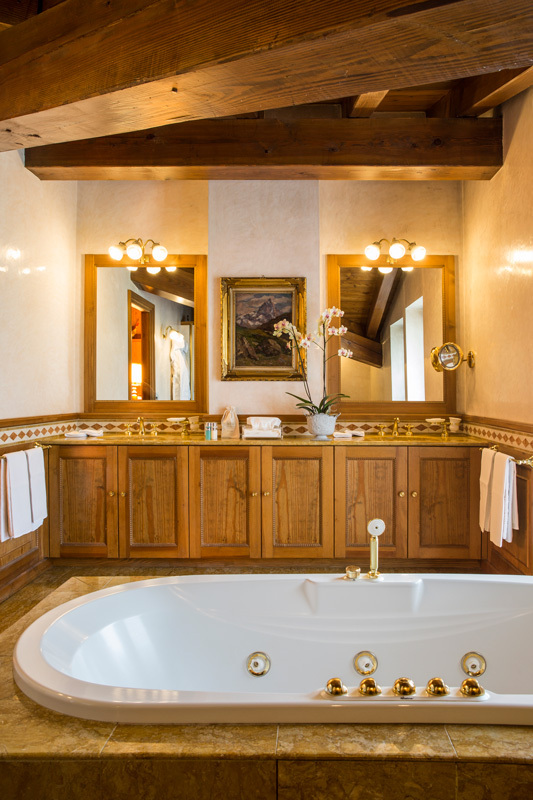 He is a fast paced manager and he has already fulfilled prestigious roles in major tourism organization such as Relais & Châteaux, Cervino Tourist Management, Federalberghi. We would like to let our guests discover the charming of our mountains and let live them new emotions outside the common. We want to personalize each stay according to the needs of our guests offering them tailor made experiences. 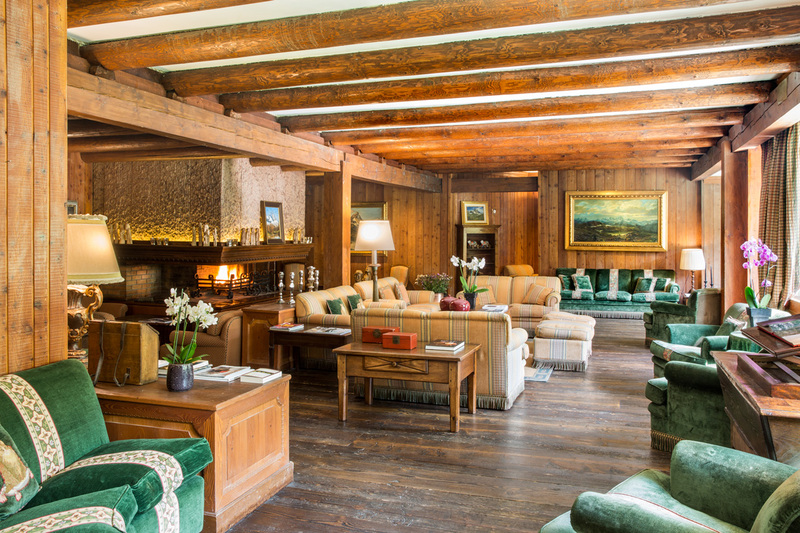 The Relais & Chateaux Hermitage Hotel & Spa placed at 6500ft, at the foot of the Matterhorn. The hotel differentiates itself not only by its attention of details but also by its close relations with the traditions and history, maintained over time by the Neyroz family, who has been running the hotel since the very beginning, 1975. The care and maintenance of the structure is always done with a cautious hand. The last renovations where made in 2015. Family welcoming hotel since its opening, you are welcomed with friendliness like in a private household without the nuisance of the formality of the big city hotels. 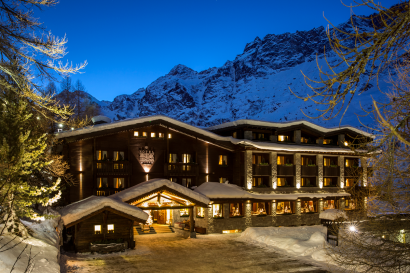 Cervinia is one of the most famous and highest ski resorts in the Alps located in Italy close to the Swiss border, at the foot of the Cervino/Matterhorn at 2050 mt. It is very easy to access from Milano, 2 hours from Malpensa airport, and 1 hour 15 min from Torino airport. 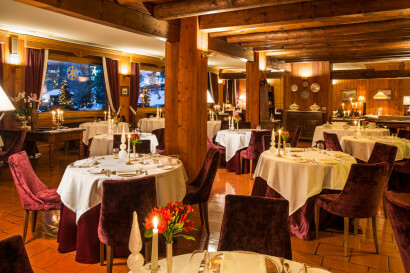 The Relais & Châteaux Hermitage Restaurant & Beauty is placed at 2050 m at the foot of Cervino-Matterhorn, with a large “domaine skiable” beyond compare: starting from 350 km of slopes between the Cervinia – Italy and Zermatt, in Switzerland, from the 3,883 m of the Piccolo Cervino descending to the 1,524 m of Valtournenche. Ski runs offering the chance to ski all day without ever repeating the same run twice, alternating easier runs with those of increasing difficulty. 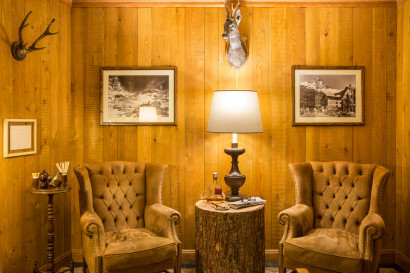 The hotel offers private baby-sitting service upon request. During the winter season is available for all our little guests a playing room with screen, sky tv and cartoons and games. • All the rooms and Suites are decorated in a unique way and furnished with authentic and traditional pieces which have been restored, wood is dominating the furnishing together with other valuable materials as the marble in the bathrooms and the precious stone of the Italian Alps. 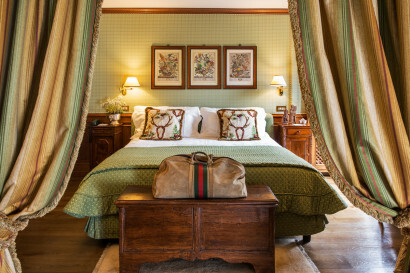 • Decorations and antic stamps embellish the ambiance and provide a sophisticated and refined atmosphere. 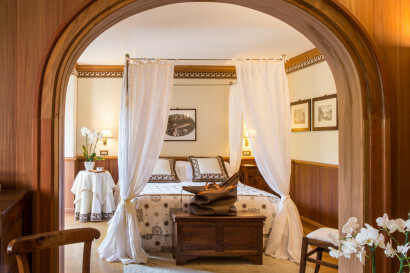 • The common parts of the hotel are equipped in an impeccable way and invite immediately to stay some days. 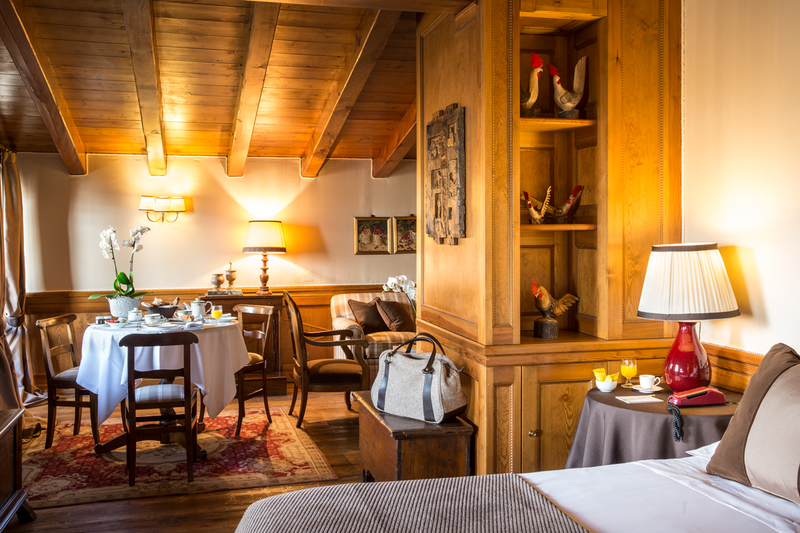 Presented as a big chalet, following the authentic mountain traditions with warm, dark wooden interiors the hotel has a welcoming, yet exclusive atmosphere. 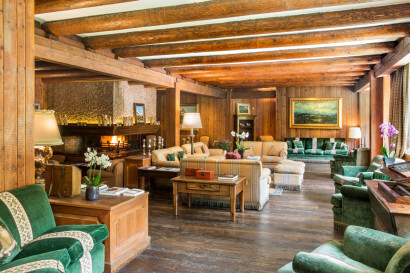 • The drawing room with the big fireplace in the centre, enriched with a parquet of the 17th century, restored from an old refuge. The materials are all valuable, perfect in styling also in the finest details. Our rates include the half board basis with ‘à la carte menu’. The kitchen is another unmistakable part that characterizes the stay at the Hermitage, with plates of big perfection, expression of the tradition of the Aosta Valley, prepared with passion and professionalism. A cuisine dedicated to the tastes of the past, which expresses the love to these mountains and the respect to the centuries-old customs, hand down from the Neyroz family from father to son, preserving the fortune of the gastronomic heritage. A carefully choice of ingredients of regional products is guaranteeing the high quality of the restaurant. The wine list offers an assortment of some of the most precious wines ever produced. 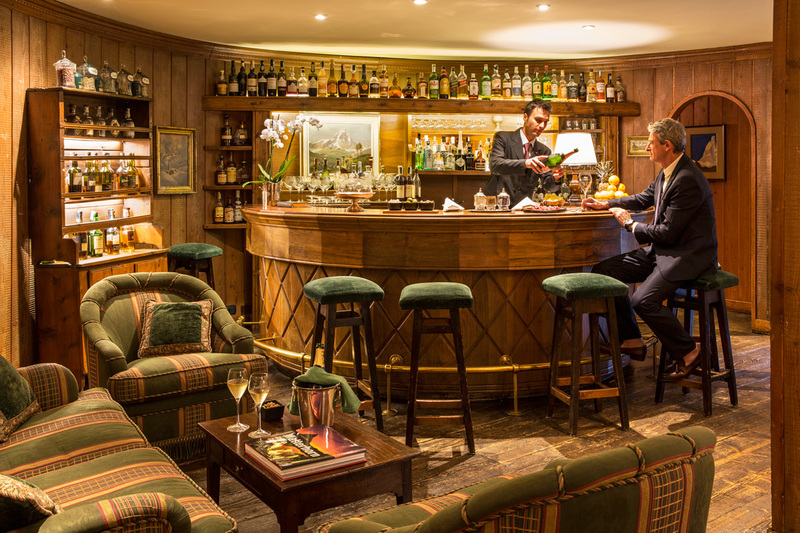 The finest Italian and foreign bottles, in total there are more than 600 different wine labels to chose from. In our wine cellar we organize wine tasting and private dinners with different themes, where we pair wine and appetizers. 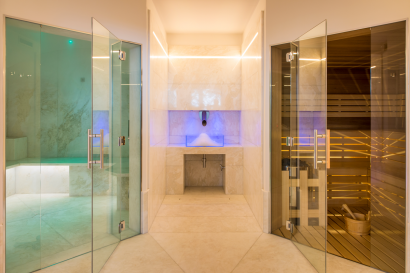 The Relais & Châteaux Hotel Hermitage has expanded his offerings with a new Spa of 400 square meters created for who in addition to an active and sporty holiday wants to take the time to pamper herself, to regenerate, relax or just be pampered with luxury treatments by La Prairie. 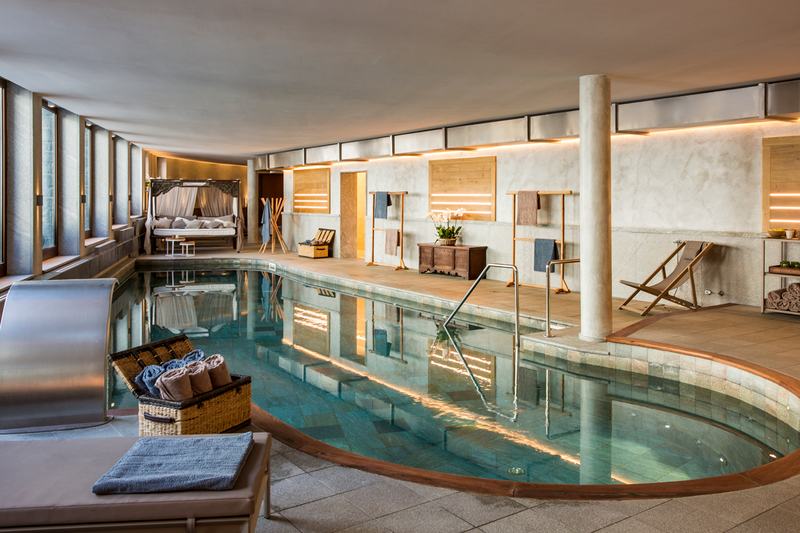 In the Hotel, the most traditional treatments like massages, manicures and pedicures are combined with the latest developments for the face and body treatments. We also offer an indoor pool with Jacuzzi with spring water from our private source, sauna and steam bath and gym to complete the experience. • The Hermitage Hotel & Spa is the ideal place for your executive meetings and events and it disposes of a nice and professional meeting room. The room is equipped with the visual and sound up-to-dated systems. 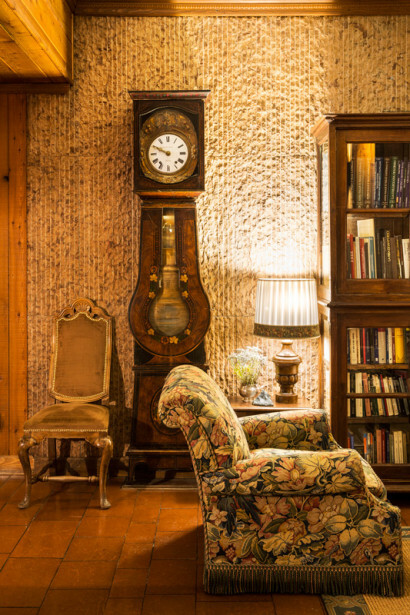 You will enjoy the warm atmosphere and our customized and personalized service. • Cross country ski runs: 3km in Cervinia and and 10km in Valtournenche. 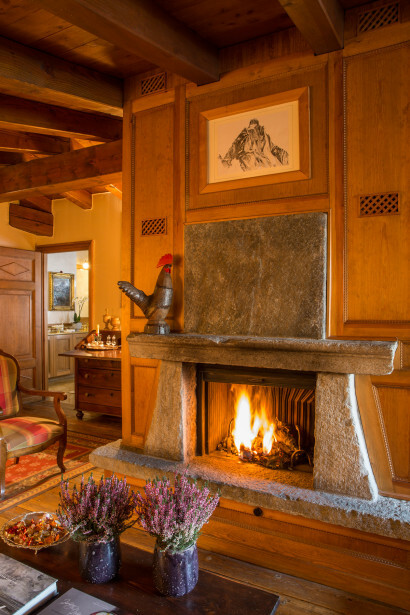 • Enjoy down skiing or snowboarding at night, by the light of a full moon, after a dinner at the chalet. The experience is possible only if accompanied by an authorized ski instructor. 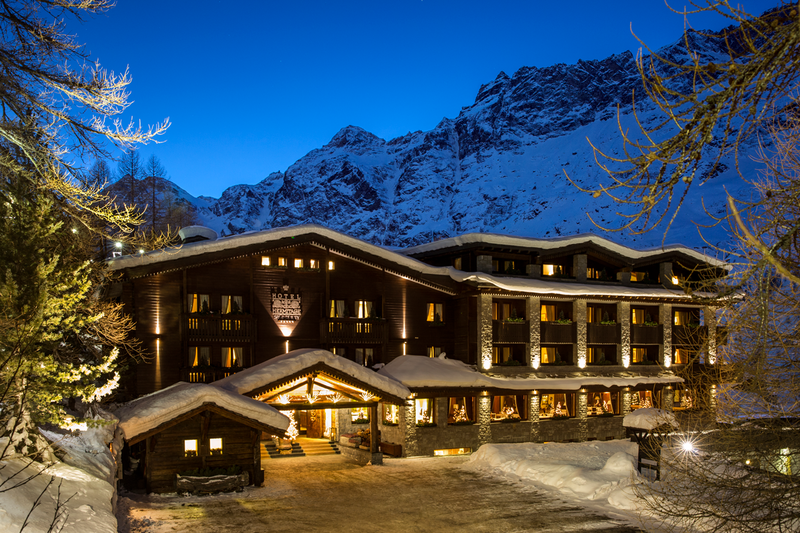 The Hermitage Hotel Spa & Beauty Cervinia has been voted the best ‘Ski boutique hotel in Italy’ at the first edition in 2013 and in the second edition in 2014 of the “World Ski Awards” in Kitzbühel (Austria), the worldwide competition reserved to the mountain hotel. Awarded by a jury of professionals of the tourism industry. 2014: a star for our wine list at “World’s bests wine lists Award”, assigned by “The World of Fine Wine” one of the most important wine magazine in the world.